Roxie is a 7 year old dog owned by Susan Picking, a Physical Therapist with the Meriden, CT Public Schools. asses to allow me to incorporate Roxie into my physical therapy program at the school and have been incorporating Roxie with the Mutt-i-grees® Curriculum at Ben Franklin elementary school. Although Roxie works with the special needs population, every one at the school is excited to see her. She has a great bond with the children and they respond to her in a way that they don’t often do with adults – she has been a tremendous help. 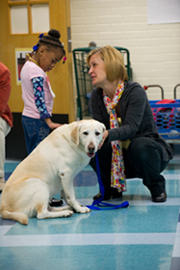 Roxie is also working in classrooms integrating the Mutt-i-grees® Curriculum. The children work very well with Roxie and enjoy her time in the classroom. Cathy Battista, who is in charge of the Family Resource Center at Ben Franklin, was instrumental in bringing the Mutt-i-grees® Curriculum to Ben Franklin and suggested that Roxie become one of the team player in getting the curriculum implemented!